As the first day of school nears, it won't be long before I see a child walking through the hallway holding a glass jar with a lid. Other students will crowd around the jar to view its contents: a chrysalis. Kindergarten classes at my school (and across the country) study the life cycle of the butterfly in the fall. The classes watch in amazement as caterpillars transform into butterflies over the course of a few weeks. It's an ideal science unit that helps students develop observation skills and gets them excited about nature. Bearport Publishing has released a new series, Animal Diaries: Life Cycles, that is perfect for teaching young readers about the stages of life of various creatures including butterflies, frogs, snakes, spiders, and kangaroos. 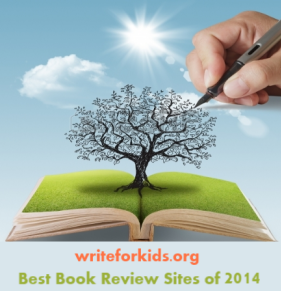 A Butterfly's Life is written in the form of a child's science journal, and this book succeeds on many levels. It's an excellent model of science writing for students learning to make observations, it will satisfy the curiosity of K-3 nature lovers, and it can be read aloud to primary classes as part of a science unit. A young boy named Sam writes down his observations in a science notebook. Each entry begins with the date. In July, Sam observes Monarch butterflies in his yard. In the next entry, Sam spots butterfly eggs attached to leaves near his home. Ten days later Sam sees caterpillars. The book follows the entire life cycle of the butterfly. The text is printed on a graphic of a wire-bound notebook. The font is large, and the margins and spacing are helpful for beginning readers. Bold print highlights new vocabulary words such as mate, chrysalis, and proboscis. The definitions to new words can be found in a visual glossary in the back of the book. Each two-page spread includes a journal entry on the left side of the page with close-up and colorful photographs on the right. An impressive series of five photographs shows a butterfly emerging from the chrysalis case. In another photograph hundreds of monarch butterflies soar through the sky. Inquisitive readers will enjoy reading the related facts printed on brightly colored flowers on the sides of the pages. Back matter includes a clearly labeled map showing butterfly migration patterns, instructions for growing flowers, a visual glossary, and an index. 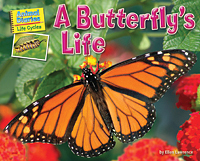 If you're looking for a quality nonfiction book to introduce primary students to the life cycle of butterflies, this is the book you should purchase. For a fun fiction pairing, read Velma Gratch and the Way Cool Butterfly by Alan Madison and Kevin Hawkes.